Refunds notwithstanding, digital video game purchases are normally a one-way street, but what if they weren’t? A question from a recent Xbox survey asks gamers if they’d part with their digital acquisitions for 10 percent store credit. The image below popped up on Reddit yesterday, and the hypothetical it presents is interesting. 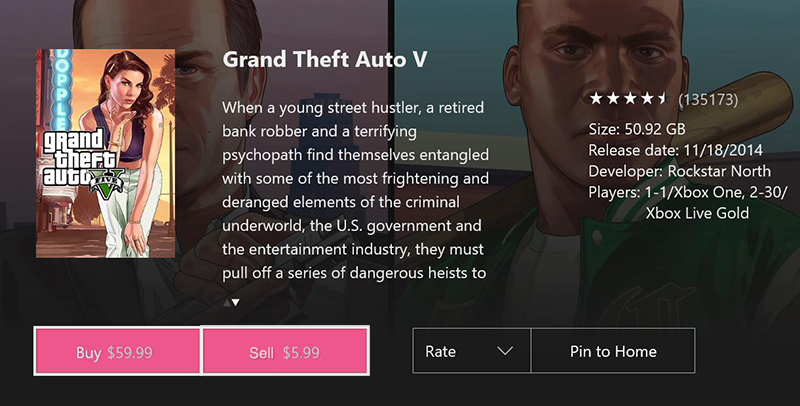 Trading in a $60 game and getting back $6 might not seem like a fair deal. Considering the alternative is a dusty digital locker filled with games you never intend to play again with no avenue of exchange other than selling your Xbox Live, PSN or Steam account outright, it’s not so bad. Between the three services I’ve accumulated hundreds of digital titles over the past couple of years, and I’d say a good two thirds of those are games I will never touch again. Were they physical copies the collector in me would be compelled to make them look pretty on a shelf. Instead they’re just ghosts wandering an electronic limbo with business that will never be finished. I think the more important angle of this hypothetical trade-in program is what would the platform holder do with the reclaimed goods? Despite their intangible nature, digital games carry real value. Publishers sell their product to resellers, who in turn sell access to that product to consumers. So where would that access go once a digital game is traded in? Were Microsoft to offer such a program, would they then be able to turn around and resell those rights at a lower price? Reading deep between the lines, it sounds like the Xbox survey is kicking around the idea of used digital games. That’s mildly frightening. The rise of the digital download has taken a bite out of used game sales, helping more money into the hands of the folks making the games. If a digital game trade-in program undermined that, I’m not sure I’d be keen. So my answer to the survey question is currently “Don’t know/Not sure.” No matter how neglected some of them may be, I’d need to know what’s going to happen to my digital games before I’d consider giving them up for small change. I’d love to hear what you folks think. The comment section is yours.